High quality wooden table talkers with solid dark ash base. 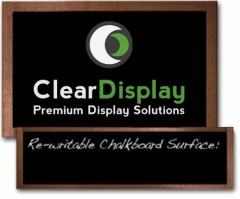 Special chalk surface, easy write on wipe off surface. Discounts available on large orders, please contact us for details. Available in many sizes - contact us for further details. Require print? 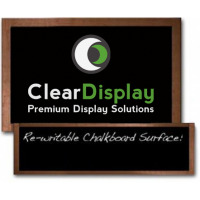 We can add your logo, or print options to the chalkboard or wood panel. 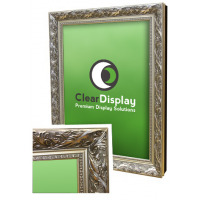 Wooden poster frames give a great, professional look to any poster display. They can be custom sprayed with a different finish. Our standard units have a dark ash finish with blackboard inside - perfrect for when you dont have a poster inside, and using chalk instead. 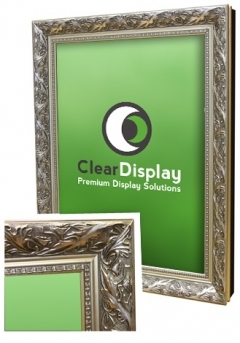 Wooden Poster frames can be manufactured in antique gold, silver and various sprayed colours. Call for details. NEW hinged ornate guilt wooden poster frame. 3D moulded frames in silver & dark surround. Re-writable blackboard for when posters aren't displayed. 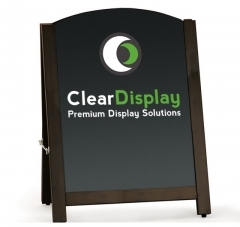 Matching ornate framed chalkboards, blackboards & mirrors are also available. Framed guilt poster frames can be custom manuactured with a different style & colour, contact us for details. 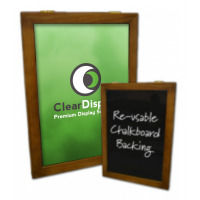 High quality, solid ash framed wooden chalkboards, easy to hang on any wall. Designed for use with ChalkPens and we recommend ZIG Posterman© brand. Can be either internal use, or a higher quality external use board. All chalkboards are custom made to order. Custom sizes & printing available. 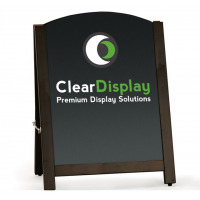 Budget Chalk A-Board - our budget chalk a-frame chalkboard with rounded top is ideal for roadside advertising. 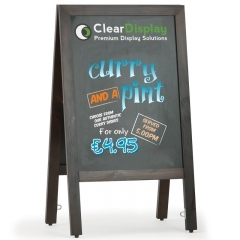 The Reversible Chalkboard is a reversing chalk a-board ideal for pubs, bars, restaurants and hotels. 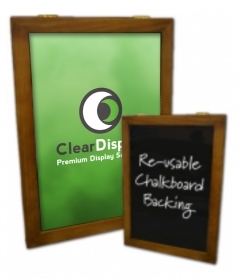 It has a traditional wood frame, with high quality, reversable laminate chalkboard panels. Internal or external use, they also have rubber feet to protect surfaces and improve stability. It is available in either A2 or A1 size, and can be used with either traditional chalk or liquid chalk pens. 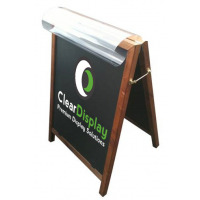 The poster holder chalkboard is a high quality poster holding board, with thick PVC covers attached to the frame of the board, for easy poster changing ability. When a poster isnt in the unit, you can write on the chalkboard and it will not only provide a perminant message, but also be waterproof too! It has a number of clever features, such as metal loops on the legs so you can secure your a-board with a chain if you are concerned about it being stolen.